Galerie Bernheim-Jeune, Paris (no. 27488). Galerie Max Kaganovitch, Paris (before 1936). Acquired from the above circa 1936 by the grandfather of the present owner. Aix-en-Provence, Pavillon Vendôme, Paysages du Midi de Cézanne à Derain, July-Aug. 1969. Patrice Dauberville will include this painting in his forthcoming second supplement to the Bonnard catalogue raisonné. 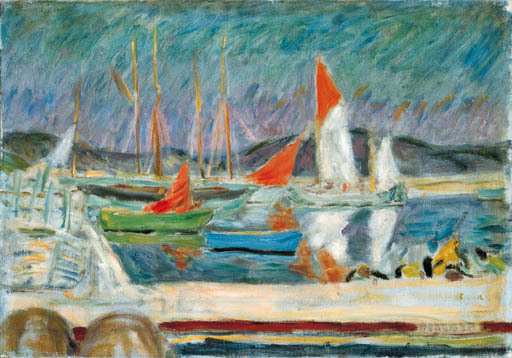 Please note the correct title for this painting is Voiliers dans le port de St-Tropez, and that it was painted circa 1914. Galerie Bernheim-Jeune, Paris (no. 24.488), by whom acquired from the above on 25 November 1925. Escoffier, Paris, by whom acquired from the above on 13 January 1926. Galerie Kaganovich, Paris (by 1936).